Futami Shōkai was a Japanese sales company in the early 1930s, based in Ginza (Tokyo). It was still in existence in 1949 at a similar address. ↑ Its exact address in 1930 was Tōkyō-shi Kyōbashi-ku Ginza 2–1 (東京市京橋区銀座二丁目一番地). 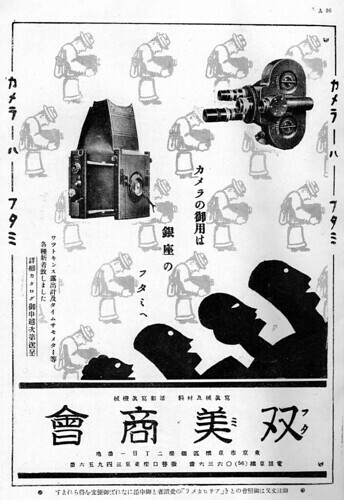 Source: advertisement in Asahi Camera February 1930, p.A16. ↑ Its exact address in 1930 was Chūō-ku Ginza 4–2 (東京都中央区銀座4–2). Source: advertisement in Ars Camera February 1949. Ars Camera. 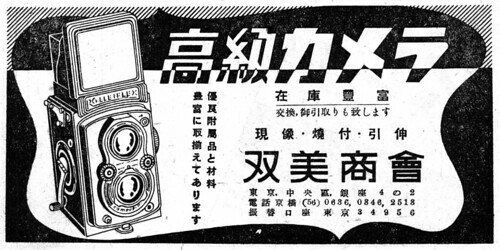 Advertisement by Futami Shōkai in February 1949 (p.27). Asahi Camera. 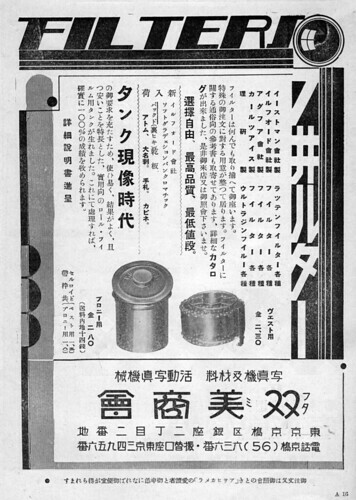 Advertisements by Futami Shōkai in February 1930 (p.A16) and June 1932 (p.A16). Nihon Shashin Kōgyō Tsūshin (日本写真興業通信). Hyaku-gō goto jūkai no kiroku (百号ごと十回の記録, Ten records, every hundred issues). Tokyo: Nihon Shashin Kōgyō Tsūshin Sha (日本写真興業通信社), 1967. No ISBN number. Advertisement on p.83, corresponding to p.5 of the April 20, 1948 issue. This page was last edited on 17 January 2019, at 11:44.